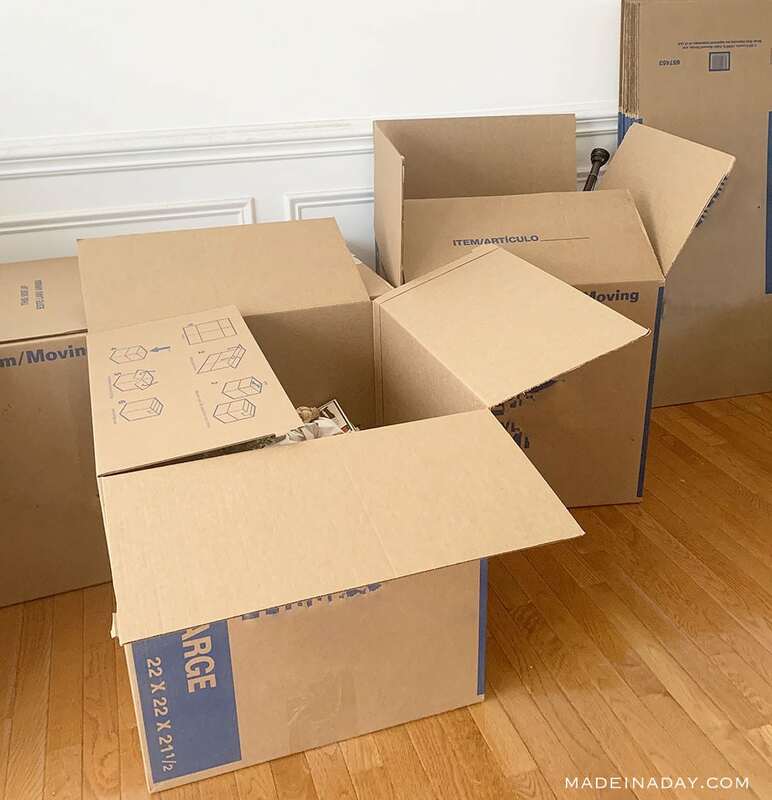 Planning a big move and not sure how to get rid of furniture? 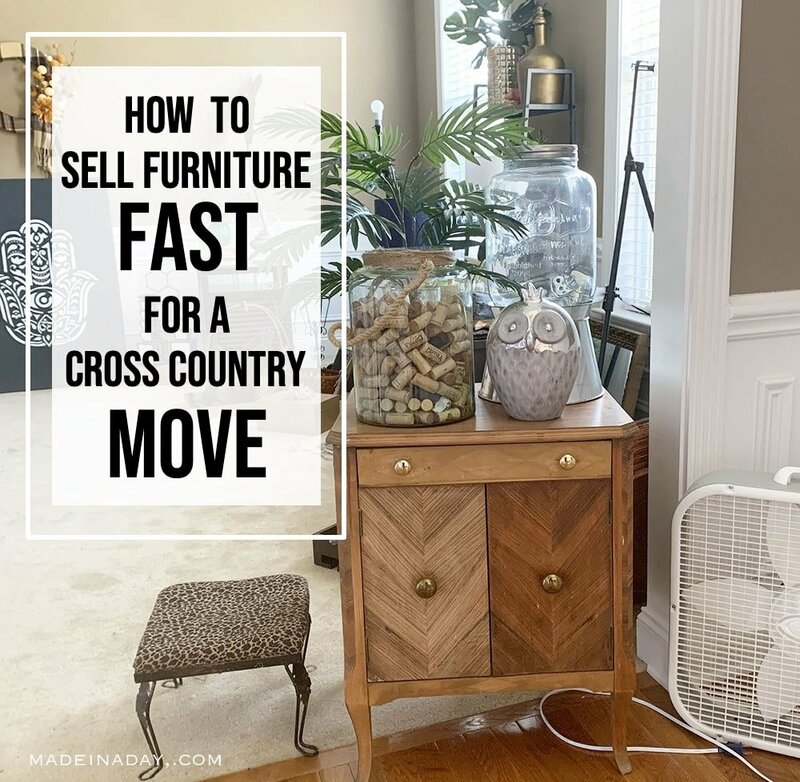 See my tips for the Fastest Way to Sell Furniture for Cross Country Move. We sold it all in three days! We have decided to move across the country. It’s a huge move from the East coast to the West coast! My husband’s company wants him to be closer to one of their main offices so ee decided to take the plunge. We have to get rid of everything and start over when we get to our new space. We bought a much smaller home for a significant downsize. Now that our kids are older we are done with the hassle and maintenance that comes with trying to maintain a large home. 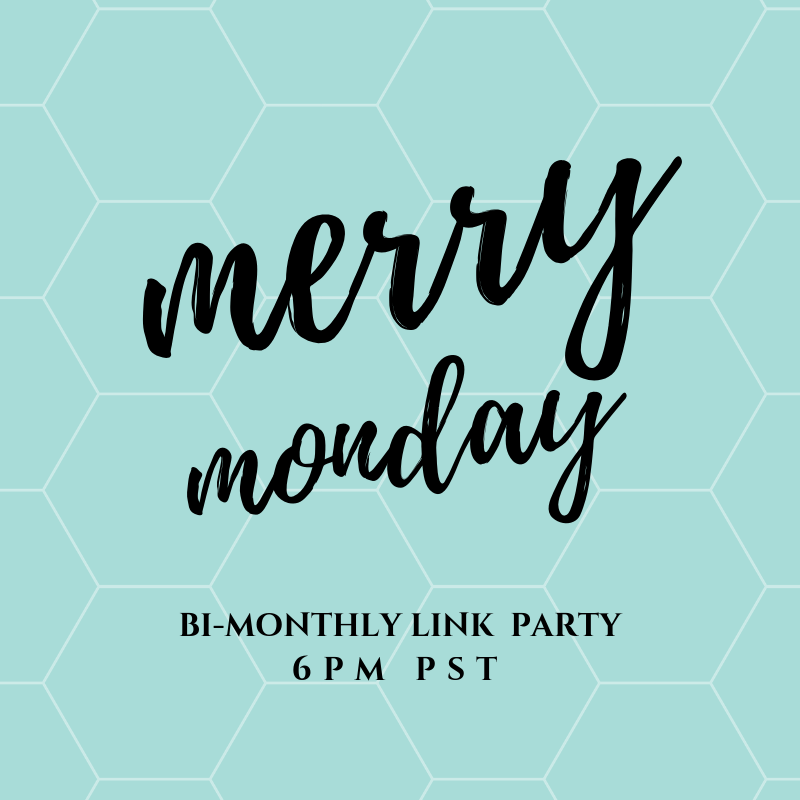 We are super excited to downsize but once you start thinking about getting rid of everything it can be super overwhelming. 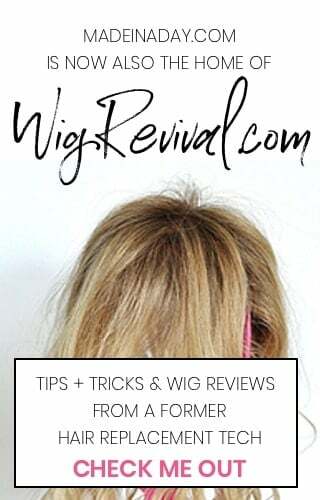 Here are our tips and tricks for how we cleaned out our house of a large amount of stuff in just three days. The first thing we did was to clean out the furniture and home decor items we were going to sell. Donate items you haven’t used and toss things out that are broken or not useable anymore. TIP: Getting rid of items that have been with you a long time is one of the toughest things to do when you downsize. Our new home has some great storage areas, but they are limited. To get motivated, we watched TV shows like Tidying Up with Marie Kondo and Hoarders. One thing I learned from watching these shows is for a successful downsize, it is crucial to get into the right mindset to let things go and not be attached to them. I had one big plastic bin that I put sentimental items like pictures and family heirlooms. Some items can be given to other family members to keep. The the rest I had to just say goodbye to and donated them. Clean out bathroom cabinets, kitchen cabinets, desks, and closets. Keep only the minimum things you are going to use. 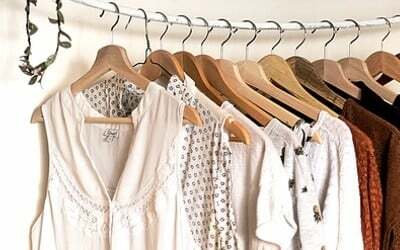 One of my biggest challenges is my walk-in closet. My new home’s master closet size is about 1/8 of the closet I have now. I chose the clothes that make me look my best and that I continue to wear. I have two large plastic bins for clothing for the seasons. One for summer and one for winter. If you haven’t worn an outfit in two years. You probably will not wear it again. Just let it go! You can always buy more items when you get to the new home. 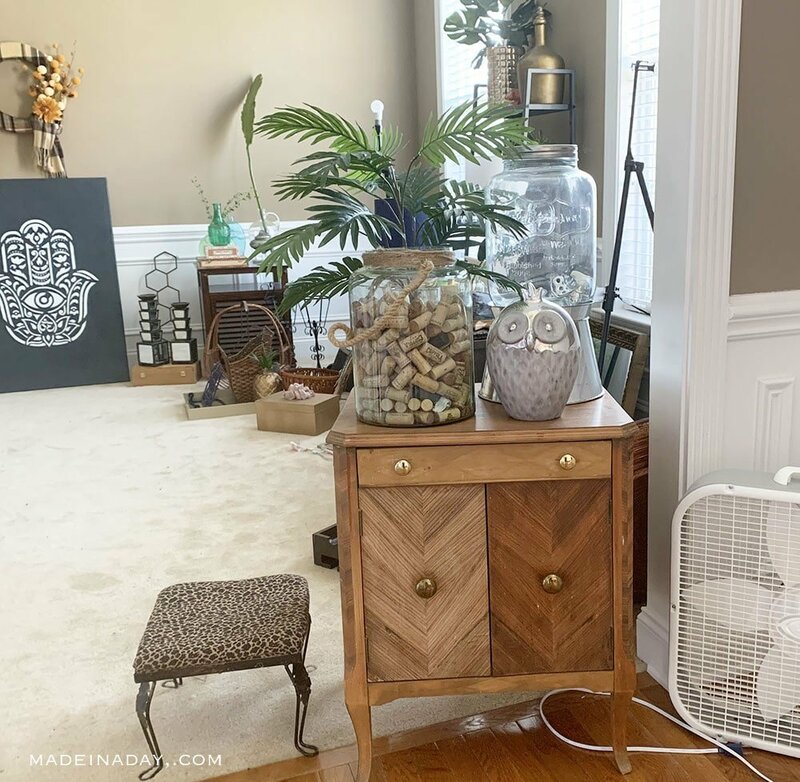 One of the things we did first was to let our friends and family members chose the items they loved and wanted the most from our home. Charging your friends is something you would have to decide for yourselves. We chose not to charge them because we wanted to get the furniture moving out of the house. Most of the things they wanted were items like seasonal decor, bedroom suits, tools and lawn equipment. We were happy to help out our friends by giving them the things they wanted. Pack up any small items like home decor or dishes that you are taking with you. This way when people come to look at your items for sale your cherished possessions won’t be asked about or haggled for. We didn’t want to be saying no to anyone for the great items we are taking with us. No negativity!! You want things to move out. Plus the house will look empty and you will have more space for placing items out you plan to sell. I used my living room as a garage sale type space. 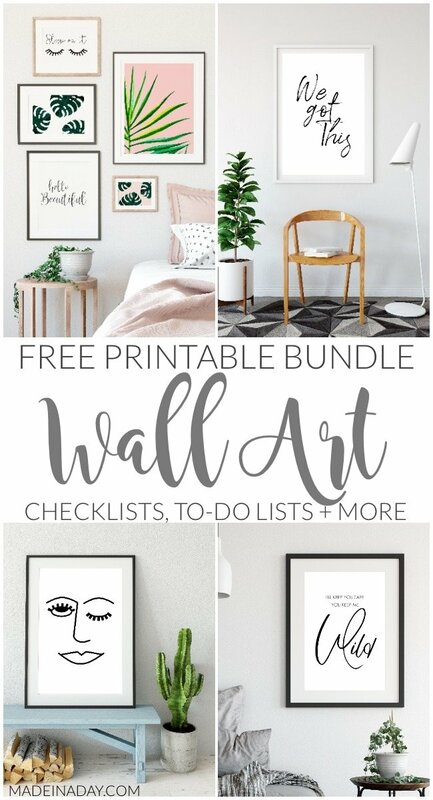 I placed wall art and small furniture items not listed in the ad so that when people came in the front door those items are the first things they would see. There are a million ways to go about selling furniture for a move. Here’s what worked like a charm for us. We chose to use Facebook instead of sites like Craigslist, eBay or phone apps. 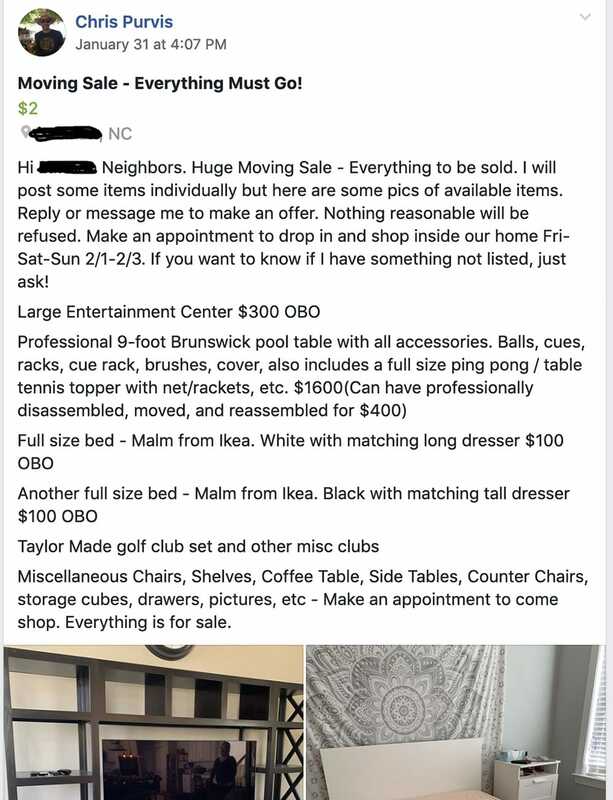 Our neighborhood has an “Items For Sale” page so we started with that. 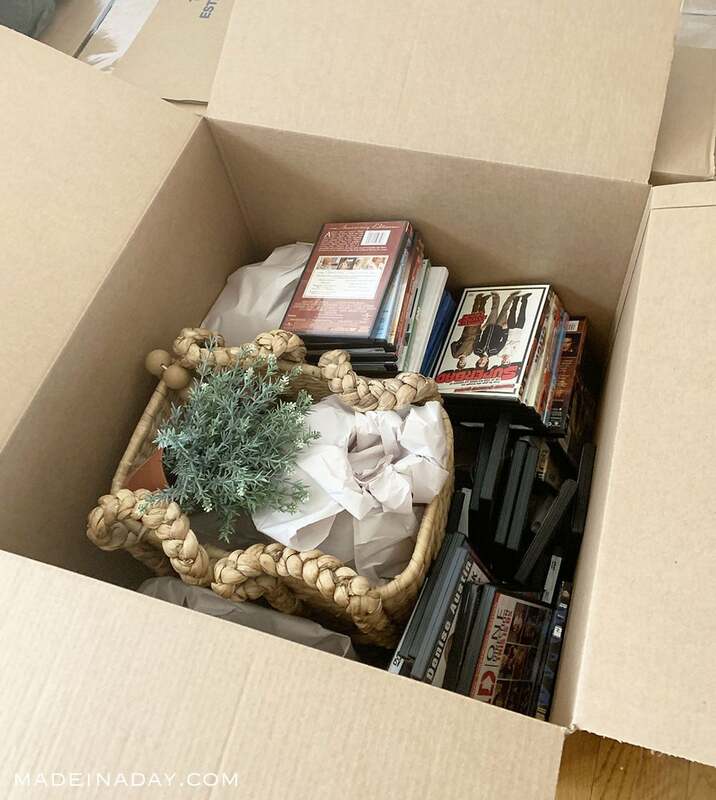 We created a post about our moving sale and how everything must go. Then we added images of furniture items and prices. We posted the sale on Thursday afternoon and set the sale dates for Friday, Saturday, and Sunday. Then we asked that if you wanted something then you would need to make an appointment to come to pick up the item. The response was completely overwhelming! We were not prepared for the huge amount of people that wanted to buy our stuff! It was incredible! Within the first half hour, we had over 75 messages for our items. There were people waiting in line for things, up to 5 people on a waitlist for certain items. We even had people coming over Thursday night to get a first look at things. Basically, it was an in-home garage sale. Selling this way was a huge success. We sold almost everything in the first two days. Then we updated the post to items that were left. The last bit of items sold on the last day. 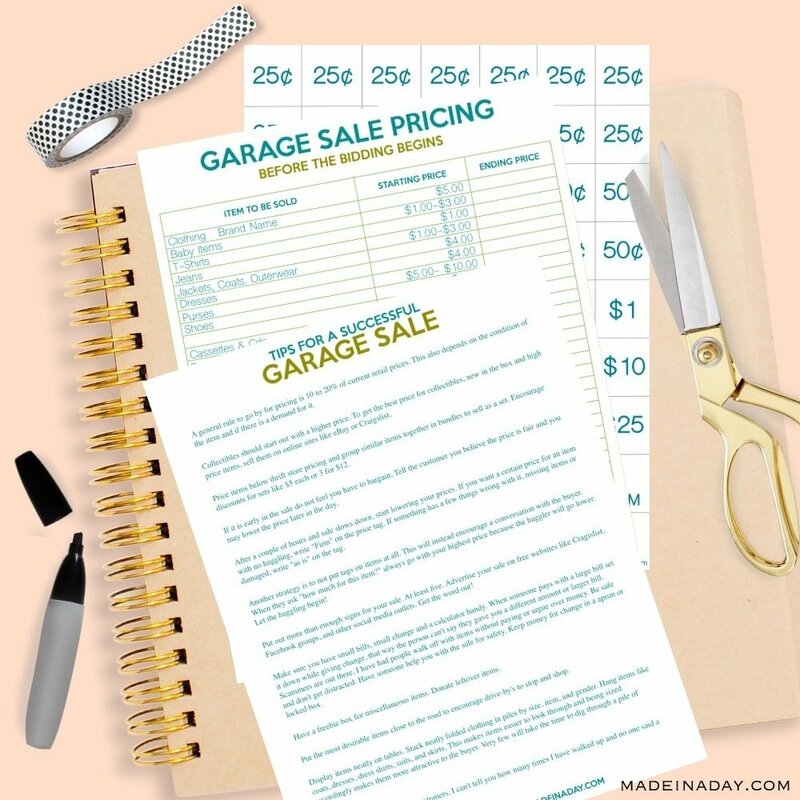 Grab my garage sale printables to use for pricing! TIP: The toughest part about using Facebook for your sale will be keeping up with the messages and who wants what. We recommend writing the items down with the names of who wants them next to the item and the people next in line for the item. This way you won’t miss someone waiting in line on Facebook Messenger. We also had people saying they were interested in items and then would not respond back if they actually wanted something. Just move on to the next person or maybe set a window for responses. These two things were the most frustrating parts of using this platform for a large sale. We sold everything though so it was well worth it! 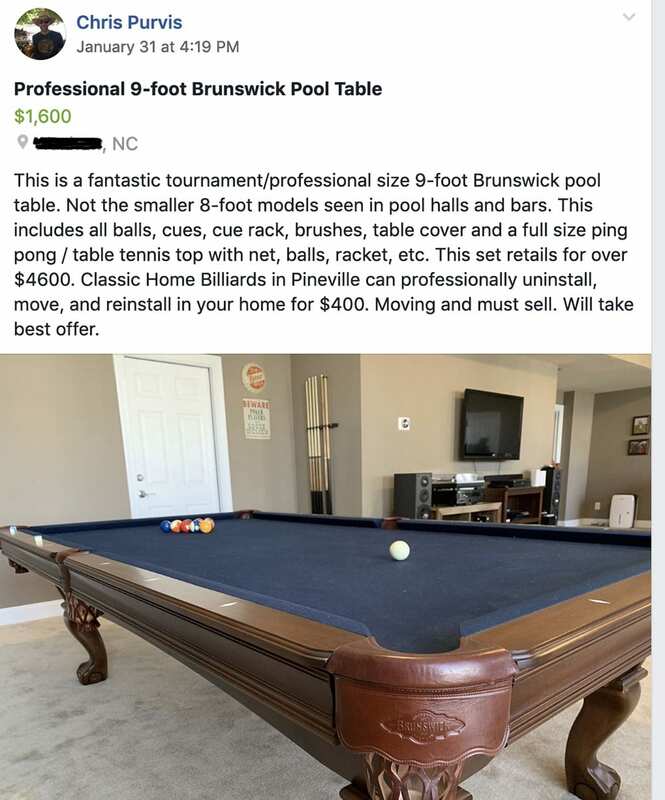 TIP: We posted some of our large and more expensive items like our pool table, on other “For Sale” pages of our surrounding communities in our area to get a better reach. If things are not being bid on then you should lower the price on the second or last day. I repeat! Do not get too attached to your stuff. It needs to move so you can move. Let it go! We had some items that were just too damaged to sell. Then gave some of the items away to people who bought other things. Next we plan to use a junk hauling service to get rid of the leftover furniture items. A cool thing we found was that you can rent a dumpster bag from your local hardware store to get rid of the large amounts of trash and random items you may have collected over the years. You just buy the bag at your local hardware store. Fill it up with the items you are tossing out. When the bag is full you can call the number on the bag and a truck comes and picks it up. Easy peasy! This is such a great idea and it will keep your yard from looking like the city dump on trash day. 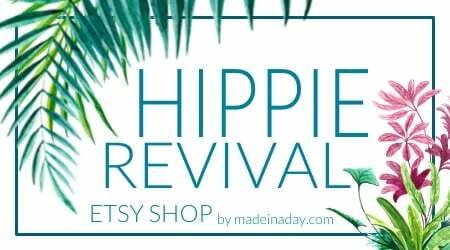 Selling our items on Facebook turned out to be the best way for us to get items sold fast. 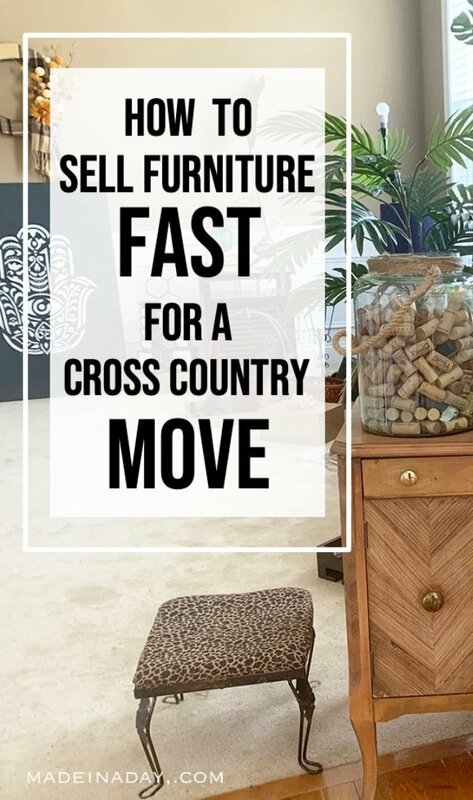 I hope my tips and tricks to get rid of furniture fast in a cross country move will work for you too! We are still cleaning out and donating at this point. Our next step will be who or how to move the remaining furniture items we are taking with us and how to get our beloved dogs and vehicles across the country. So stay tuned for how we do that! 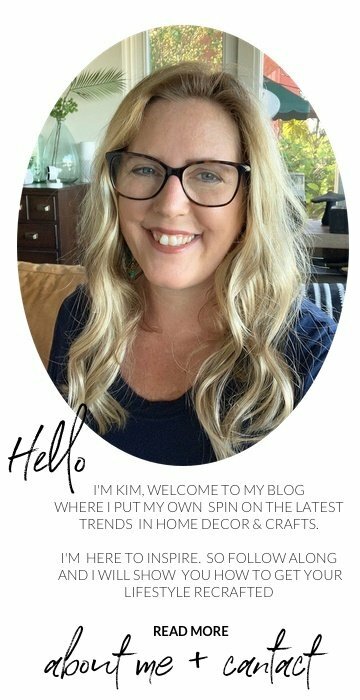 Garage Sale Printables with Pricing Chart! We want to sell our master bedroom set and WOW I need to try selling it on Facebook! I haven’t done that before, but I know there are neighborhood pages, etc. 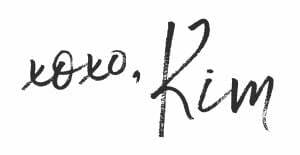 for that. Carrie, It worked like a charm! We did a free sale this last weekend and got rid of all the things that did not sell! 27 items! It works!